Gainsborough's two daughters were among his favorite subjects. He painted at least five double and several individual portraits of them at various ages. Here he suggested his daughters' interest in his own profession by showing them holding drawing materials and next to two classical sculptures. X-rays of the painting reveal that Margaret stood originally on the left side of the composition, facing her older sister, Mary. 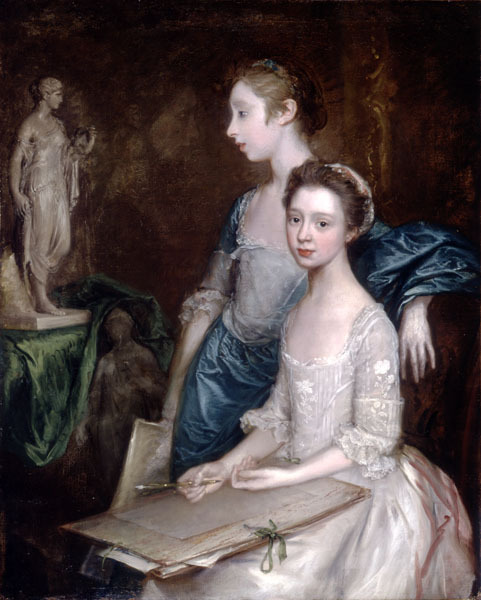 By repositioning her, Gainsborough stressed the close relationship between the two girls- a quality that can be seen also in his other portraits of them. Along with Sir Joshua Reynolds, Gainsborough was instrumental in raising British portrait painting to a level comparable to that found much earlier on the Continent. Influenced by French and Netherlandish art, especially the portraiture of Anthony van Dyck, Gainsborough incorporated elegance and expressive brushwork into his portraits, making him a favorite among England's aristocratic class.